Heat oven to 325°F. Spray 8-inch square (2-quart) glass baking dish with cooking spray. Season beef with salt and pepper; coat with flour. In 10-inch skillet, heat oil over medium-high heat. Cook beef in oil 5 to 7 minutes, turning occasionally, until brown on all sides. Place beef, onion and celery in baking dish. Pour broth over beef and vegetables. Cover; bake 1 hour and 15 minutes. Turn beef over; add carrots and potatoes. Cover; bake 1 hour. Uncover; turn beef over and bake 30 to 35 minutes or until beef and vegetables are tender and broth is slightly thickened. Skim excess fat from broth, and serve. 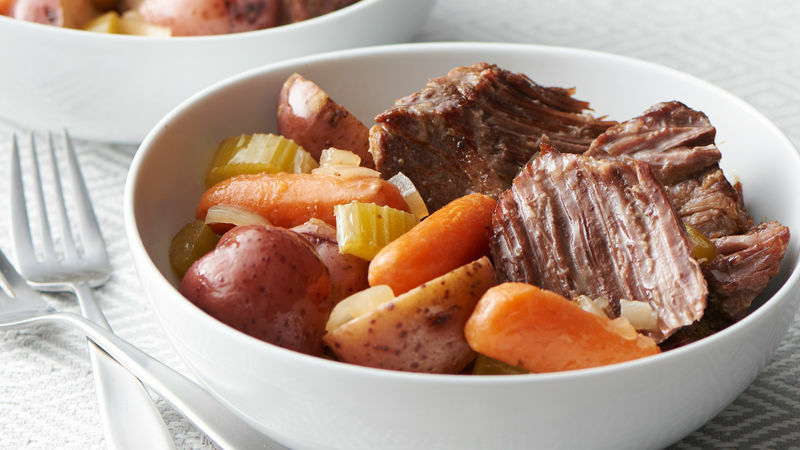 Chuck roast typically comes in pieces that are about 1 1/2 inches thick. If your chuck roast is thicker than that, you may have to adjust your cooking time, as thicker pieces take longer to cook. We used small potatoes in this recipe that were about 1 1/2 inches in diameter. If your potatoes are larger, just cut them into quarters.